Lemon, poppy seeds and blueberries… what a wonderful combination! These pancakes are SO good that no one will ever guess that they are grain-free! These pancakes are light and fluffy, just the way pancakes should be! My favorite time of the year, Blueberry Season! I am fortunate to have an unlimited supply of “organic” big and juicy blueberries at my disposal from my in-laws 2 bushes. For a few weeks, we eat them a few times a day, put them in smoothies, freeze them for a cold treat and I create as many blueberry treats as I can! 🙂 This blueberry compote can be used on anything and is PERFECT on these lemony pancakes. How are you liking the new look to the blog?? Be sure to check out the “Recipes” page where you can view the image of all of my recipes on one page! Check out the screen shot of all of the breakfast recipes! With over 270 recipes on my blog, this should hopefully help you find the perfect recipe! Please tell me I am not the only one who thinks about the Seinfeld episode where Elaine fails a drug test (actually a couple) because she was eating poppy seed muffins?!? Check out this short clip… hilarious! So will eating poppy seeds cause a drug test to come back positive for opiates?? The simple answer…. Yes! So there you have it… eating too many of these pancakes can cause your employer to think that you are on drugs! 😀 If you can’t have poppy seeds, omit them and maybe add a few finely chopped nuts or a few seeds for a bit of texture. Each of these ingredients contributes to making these pancakes nice and airy. Be sure not to over mix the batter once you have folded in the egg whites. Check out my Fluffy Blueberry Pancakes post for a step-by-step guide to mixing up your batter to insure the pancakes get a good rise. This recipe is delicious as listed but can be modified to fit your specific dietary needs, goals and taste buds. Here are a few modifications that I KNOW will work. If you modify it in any other way, please let me know in the comments below. Sweetener– Use any sweetener you choose in the recipe, just be sure to taste your batter before cooking the pancakes. For questions about sweeteners, be sure to check out THIS post. Fat of choice– I used butter but you could also use ghee or coconut oil for dairy-free. Also feel free to use expeller coconut oil. Milk– Use whatever milk you choose. Buttermilk, regular milk, heavy cream, sour cream, coconut milk or unsweetened almond milk will all work. My favorite is a combination of 2 tbsp. regular milk along with 2 tbsp. sour cream. Lemon Flavor- I am not a big fan of lemon extract so I chose not to add any. I relied on the zest and lemon juice for the lemon flavor. Dairy-Free– Use unsweetened almond or coconut milk for the dairy and ghee or coconut oil for the fat. Nut-Free– For nut-free, substitute ground raw sunflower seeds in the place of the almond flour. Waffles– Feel free to use this batter to make waffles as well. *I used 1/8 tsp. Trader Joe’s Stevia and 1/2 tbsp. raw honey. The amount of sweetener needed will depend on the sweetness of your blueberries. Check out THIS blog post for more information on my sweeteners of choice. *Use milk of choice. I used 2 tbsp. pure sour cream and 2 tbsp. regular milk. Add the blueberries to a small sauce pan. Using a potato masher, mash the blueberries just a few times to release some of their juices. Cover and cook the blueberries on medium-low heat for approximately 8-10 minutes or until blueberries have burst. While berries are cooking, add the arrowroot powder to the water and stir. Set aside. Once the blueberries have burst and released their juices, remove the lid and lower the heat to low. Stir in sweetener then add the arrowroot and water. Stir the blueberry mixture until it starts to thicken (about 1 minute) and then turn off the heat. Taste for sweetness and adjust if needed. Refrigerate or serve warm. Makes about 1 cup. Blend dry ingredients, including poppy seeds, in a medium bowl. In a separate bowl, beat egg whites with hand mixer until SOFT peaks form. Add egg yolks, butter and milk of choice to dry ingredients. Blend well until all ingredients are incorporated. Gently fold egg whites into pancake batter. Do not over mix. Taste for sweetness and lemon flavor, and adjust if needed. Or Quick Method: Mix dry ingredients in a bowl. Add all of the wet ingredients to a blender and then the dry. Blend for 1 minute. Serve hot with Blueberry Compote and salted butter (optional). Pancakes freeze well and can be reheated by placing in a toaster on a medium setting. I never would have dreamed that lemon and blueberry would go together. But they do! 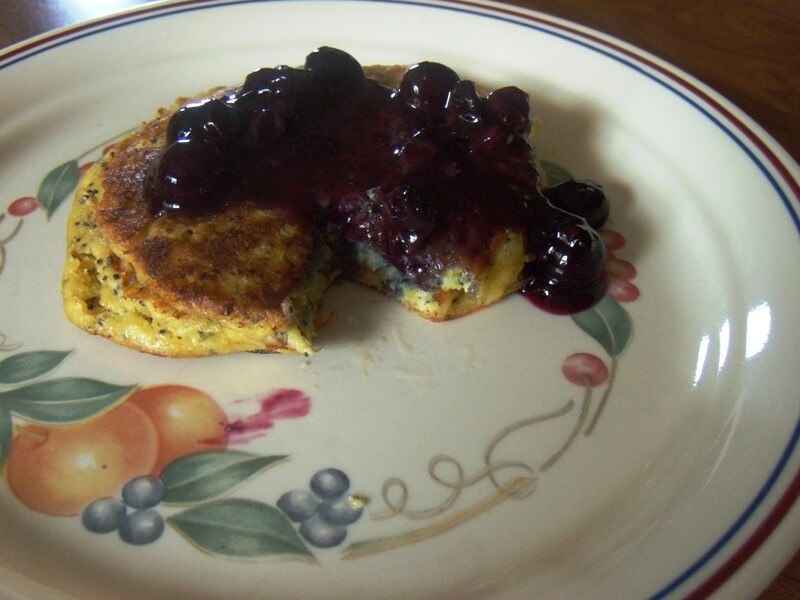 And these pancakes topped with blueberry compote are absolutely delicious! Yes, I did make 6 of them but…2 are plenty filling – the other four will go in the freezer. Thank you again, Melissa, for coming up with another winning recipe. And for making breakfast (or today’s lunch) anything but boring. Ηі, just wanted to tell you, I liked this post. It was inspiring.